There are very few medical devices that cost two dollars, but the Boston based startup eyeNETRA (@eyenetra), has developed a truly jaw-dropping smartphone attachment that costs two dollars and could help billions of individuals around the world currently without access to eye-care. eyeNetra’s invention (from the MIT Media Lab – surprise surprise) is a way to measure near or far-sightedness by combining a simple optical attachment with software on a mobile phone. With billions of people in the developed and developing worlds alike suffering from uncorrected refractive error, you can imagine the impact on illiteracy, unemployment and poverty. eyeNetra points out that the cost of providing eye glasses is down to $3, but the cost of an eye exam is still far too expensive. eyeNETRA’s solution has already been recognized as the winner of the 2010 Vodafone Wireless Innovation Awards and received an innovation grant from Google. Read below about how it works and my interview with co-founder David Schafran at last week’s mHealth Summit. According to the eyeNETRA’s information document, the standard method for diagnosing refractive eye conditions is the Shack-Hartman device, which shines a laser into the patient’s eye and measures the refracted light with a wavefront sensor. The company’s Near Eye Tool for Refractive Assessment (NETRA) is the inverse of a Shack-Hartman device. A patient looks at a cell phone screen through a simple pinhole array at a very close range and aligns the displayed patterns. Since light from these patterns go through different regions of the visual system, the act of aligning them gives a measure of the optical distortions of those regions and the required refractive correction is computed. I had an opportunity to interview eyeNETRA co-founder and CEO David Schafran and demo the eyeNETRA device knowing my eyesight is roughly 20/20. I held the device to my eye and looked into what reminded me of a kaleidoscope, with two circles, one green and one red, displayed. I simply had to use a control pad very similar to the d-pad on a video game controller to align the two circles until they were just touching. Sure enough in both of my eyes I needed to make almost no adjustment to see the two circles touching, so the device accurately diagnosed my vision to be without refractive error. 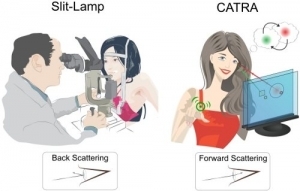 The company has also, according to another very informative hand-out, introduced a new method to assess cataracts in the human eye by crafting an optical solution that measures the perceptual impact of forward scattering on the subject’s view known as CATRA. Current solutions rely on highly-trained clinicians to check for the back scattering of light on the eye lens. Close-range modified 3D displays create collimated beams of light to scan through sub-apertures, scattering light as it strikes a cataract. User feedback generates, for the first time, quantitative maps for opacity, attenuation, contrast and local point spread functions. As eyeNETRA points out, cataract is the leading cause of blindness worldwide and one of the most prevalent diseases known to man. The driving force behind this second product is to allow a “general audience” to operate a portable, light-field display to gain meaningful understanding of their cataracts. Compiled maps simulate a cataract-affected view of an individual, offering a unique approach for capturing and sharing data for screening, diagnostic, and clinical analysis. This is a company that is less than 90-days out of the gate but clearly they have a deep and meaningful understanding of the need for a cheap medical grade device for diagnosing refractive error in patients in every corner of the world. Their solution exemplifies everything that is truly disruptive about the emerging mHealth revolution, having created a device that is affordable by any community around the world. If Schafran and his team are able to scale the manufacturing of the device while maintaining low costs, as well as add a back-end layer of eye glasses distribution, the Zappos of eye glasses if you will, I could see this device creating substantial value for consumers in both the developed and developing world. Schafran hints at his company’s intention to empower entrepreneurs with their device and allow them to distribute eye glasses without a true “store” but complete diagnostic capability. This could create an additional value proposition via the creation of new jobs and small businesses, which I envision could be like kiosks seen in malls and airports through the world. Imagine strolling through the mall and spending $5 to get your annual eye exam or to update your prescription. Definitely a company to watch closely. BTE: What was the inspiration behind eyeNETRA? David: 2.4 billion people in the world without glasses that need them and the biggest cause of that is lack of access to diagnostic testing tools. What we wanted to do was create something that was extremely low cost and needed almost no training to use that would enable patients to know their own health, as well as be able to access care through the network. That is what we are all about. BTE: When do you expect to bring the product to market and what do you think will be your ultimate business model? David: We are about a year to a year and a half away from market. We have some more product development to do and we have some trials to run on the clinical side as well as the product side and frankly on the business model side. The prototype is truly that, just a prototype. David: Right. The future is that you will have these devices at home and you can do your own tests and order the glasses all straight from home. You can do it via telemedicine if you need the doctor support, but frankly for diagnostics you shouldn’t need that, but that is long away. The mid-term model for us is to work with eye-care professionals in places like India and provide them with a device that will empower more demand and help them sell more glasses to more people. Once we have proven the model in a case like that, we expect people who are not in eye-care to use the device as well to differentiate and make more money and thats where you are seeing this distributed network effect where lots of different folks are doing testing and have access to a back-end glasses provider without having to create a full optical store. This device could become a whole new small business for people. BTE: Does eyeNetra have intentions of distributing glasses along with the device? David: That is something we have thought about and we could explore, but for now we really need to focus on the technology and the product. BTE: What is the next step for you guys in your business development? David: Right now we are fundraising and team building. We are only a month and a half old company, so we are just getting things going. BTE: How many of you are there today? David: There are three co-founders. Myself, Ramesh Raskar, and Vitor Pamplona. We are really focused on product development and trials. Of course we have done much of that already, but with medical devices there is really never enough testing you can do before you get the device out there, you have to do a lot of substantiation with the right markets. BTE: Is the core technology on the phone or is it inside the peripheral? David: Its certainly both. The core computation and diagnostics are done on the phone, the snap on is just passive, its simply optics. That is what makes the device so cheap. If you already have a smartphone that can do all of the computing for you, why put it inside the device too and make it prohibitively expensive. That would defeat the purpose. Vitor F. Pamplona, Ankit Mohan, Manuel M. Oliveira, Ramesh Raskar. NETRA: Interactive Display for Estimating Refractive Errors and Focal Range. Vitor F. Pamplona, Ankit Mohan, Manuel M. Oliveira, Ramesh Raskar. Low-cost and Portable tool for Measuring Eye Refractive Disorders using Active Participation. Proc. of 88th Annual Meeting of the American Academy of Optometry, San Francisco.. This really is an amazing piece on how smart phone tech with peripherals can truly revolutionize a field. Really excited to see the results from the NGOs that implement this. Hi i am a student of optometry from india and i am doing thesis on ipad for home vision screening . Does netra works on ipad or only on iphone. I wonder if Lions Clubs International is aware of this device? From what I can see, there is much hokum connected with “used eyeglasses”. (There are individuals who are trading on the Lions name for their own profit). Over time, the Eyenetra should put an end to this scam, and to the whole idea of “Used Eyeglasses” to help poor people.